Welcome all to 2014, where we will enjoy the drama of three state elections (South Australia on March 15, Tasmania before June 7 and Victoria on November 29), the US Mid-term elections (November 4), a possible federal senate re-election in WA (before April 26), an outside shot at a federal double disillusion in July/August and a very long shot at a QLD state election to boot. Last election turned out pretty poorly for me as far as electoral predictions, and obviously we hope to do better this year. 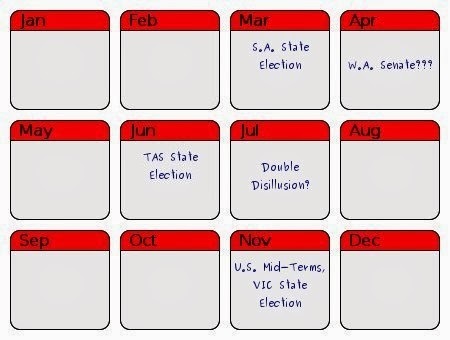 Last year's federal predictions where partly thrown by some really odd outcomes (I'm looking at you, conservative Tasmania), and partly by poor methodology. The latter can be fixed; the former will require some recalibration. Some elections are less predictable than others. To account for this we are going to start measuring successful predictions differently. Taking the simple pendulum calculations as a baseline, the test will be to see whether the Infographinomicon's predictions fare better or worse than just assuming an uniform swing based on polling. Here we see the actual results, predictions based on the pendulum/polling and my predictions side by side. Pendulum tossups occur in seats held by Independents or non Labor-Coalition parties, since these lie outside the scope of the swing calculations. My tossups are seats that I determined to be too close to call. Informally I have never allowed tossups to constitute more than 5% of my predictions. From now on that will be a solid rule here; at least 95% of all seats must have a prediction. Further, excessive tossups will count against me in this measure of success. I have opted to include tossups in the following calculations as a reward for contests where I have fewer tossups than the pendulum, and a handicap where I have more. The rating at the bottom is calculated by dividing the number of correct predictions made here by the number of correct predictions resulting from the basic pendulum method. The target is to perform in excess of 100% -- that is, to provide more accurate predictions than the pendulum. Unfortunately, in the federal election this blog was only 97% as accurate as the pendulum, which is slightly embarrassing. With 131 correct predictions the pendulum had an 87% success rate, which is not great but better than the 85% success rate of the Infographinomicon with 127 correct assessments. Ignoring tossups, the pendulum would offer a 90.3% success rate, which if passable, while the Infographinomicon only had 88.8% right. This does boost the blog to 98% accuracy compared with the pendulum, but takes unfair advantage of the two additional tossups. Without the 5% rule, it would be easy to ignore all but the safest predictions and get 100% accuracy for a rating of 111% as accurate as the pendulum. Before we get into full-swing electoral mode for the state election (or the WA senate re-vote if that comes first) I'd like to spend some time reassessing the usefulness of our predictive tools from last year and see how we can improve our methodology.